this collection is for you! This two-ebook set is written in a simple, easy-to-understand language by Ken Evans, a skilled programmer with many years of experience teaching CNC machining to industry and in the classroom. 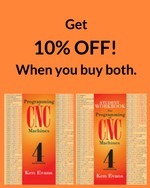 Designed to benefit students, engineers, programmers, supervisors, and machine operators who need ready access to information that will solve CNC operation and programming problems, these books include a wide range of information about the selection of tools, cutting speeds, and the technology of machining. They are filled with numerous practical exercises that help users master the basics and beyond through the application of programming functions commonly used in CNC programming. Contains a new chapter 6 that introduces Feature-Based Machining using Siemens NX 9.0 CAM. A new chapter 7 has been added that features FANUC NC Guide I programming for the popular Oi. This chapter also provides step-by-step examples for Turning & Machine Center programs. Chapter 8 on Mazatrol Conversational Programming has been expanded to include programming examples and study questions. Chapter 5 on CAD/CAM has been updated to include the current version of Mastercam X8 software. Accompanying the text is the 4th edition of the Student Workbook, which provides many practical exercises designed to verify comprehension of CNC programming. This new edition provides 37 practical exercises designed to verify comprehension of CNC programming. Prepares users for the world of CNC Programming through more than 50 problems related to CNC Basics, including shop mathematics. Contains operation scenarios that reflect situations often encountered. Feeds and speeds, tool selection and work holding methods are very hard to learn from a text alone. Practical exercises, as provided in this workbook, have proven to be an excellent teacher. This workbook can be used to verify that the student has learned the basic skills necessary to write a CNC program, line-by-line.